Do Fish Believe In Airplanes? I wonder if fish believe in airplanes. Airplanes are simply not part of a fish's universe. Most fish live in the water all of the time, and most airplanes don't go into the water. There are fish who jump out of the water, and there are fish who may have been caught on a fishhook or by a predator and escaped back into the water. But in general, fishes are in the water, and airplanes are in the air. 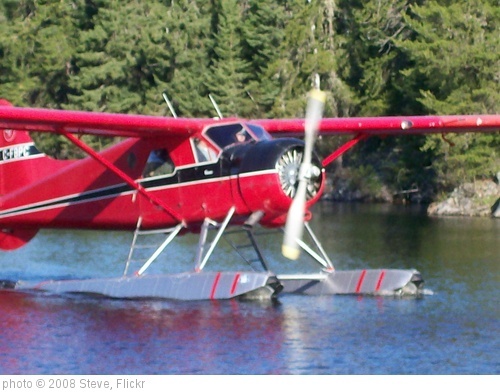 Now, certain fish might occasionally have a certain kind of encounter with airplanes. For example, on a sunny day a fish who happened to be looking up might, by chance, see on the surface of the water the shadow of an airplane which happened to be flying by. Or, a fish who lives in a place where a seaplane lands might have a more direct experience with an airplane, maybe get to touch its pontoons. An airplane might even enter completely into a fish's realm of experience if it crashes into the ocean. Of course, even a theoretical Very Intelligent Fish (VIF) would not likely be able to explain these experiences very well. A VIF would have to be in the right place at the right time to experience Airplane, and although he might be able to predict some occurrences of Airplane (say, if it was a seaplane that landed at a certain place and time every day, or if the ocean was near an airport with regular takeoffs and landings) he would never be able to make Airplane happen, or truly explain what it was. He would only be able to experience it for himself and report what he experienced to other VIF. There would be varying theories as to what Airplane is, what it means, and how best to experience the mysteries that Airplane brings, but most of what Airplane is would remain a mystery. Some fish would never in their lifetimes experience Airplane. Maybe they stay deep in the depths of the ocean where sunlight never goes. Or maybe they just don't happen to live in a lagoon where a biplane lands, or near that noisy airport where they could hear the rumbles and see the plus-shaped shadows. I imagine, though, that VIF that believe in Airplane and wanted to experience it might tend to congregate in places where Airplane might be experienced with some regularity. Or maybe not... after all, we're just talking about worm-sucking fish here. But fish, even VIF, would be making a mistake to say that airplanes don't exist at all just because they don't exist under the ocean. Airplanes inhabit a realm of existence that fish simply cannot go without help. It would be a very misguided VIF that would claim that because he hadn't ever experienced an airplane (and hadn't even tried) that he had authoritative proof that Airplane is a myth. ...And anyone who has had a genuine experience with God can tell you, even though God does not originate in or physically inhabit our realm of existence, God is still real. Occasionally God penetrates into our cosmos, and those who believe in Him sometimes gather (we call it church) to meet with others who believe in Him and to seek out those experiences, but we can't make God do things at our commands, any more than a fish can charter a flight to Disney World. Maybe there really is not a God. Even after all of the times in my lifetime that I've had experiences with what I believe to be a divine being, and even though I believe that being to be the God described in the Bible, I can't offer you physical proof of his existence. I don't have his autograph, or the jersey he wore when he played basketball in Junior High. He's not from here; He doesn't live here. Just because airplanes aren't submarines doesn't mean there are no airplanes. And just because God doesn't physically live in the house next door to me doesn't mean there's no God. Thirteen years ago today, plus a week or so, I asked my boss Harry for a week of vacation. He gave me a strange look (because I hardly ever used vacation time) and said, "Are you getting married?" I had to shush him... my girlfriend's own mother didn't even know! But that Sunday morning I picked her up as though we were going to church like always, and when I brought her back a week later, she was my wife. We spent part of that Sunday driving from Tulsa to Arkansas, where we could easily get married in a little wedding chapel we had found out about on the Internet (after all, we had met on the Internet! ), and then we spent another hour or two waiting at McDonald's because our County Clerk was out brush hogging his property instead of waiting around for us to be late for our appointment to get a marriage license! We had written our vows earlier that day at Long John Silver's, so we kind of made the fast food circuit in little Harrison, Arkansas that day. But despite being something we began secretly (her dad did know what we were up to, by the way, and approved of us getting married) and despite us spending way more time in fast food joints than anyone wants to spend on their wedding day, our 13-years-and-counting have been anything but a disposable, fast-food marriage. We've certainly had misunderstandings, arguments, and hurts, but we've had so many laughs, fun times, talks late at night, and so much love that every rough patch is totally worth it. A good marriage is funny. You start out thinking you are so alike that it's impossible to imagine not being together. Then in the first years of your marriage, you realize that you are in fact not as alike as you thought, and you learn to give each other room to grow as an individual. No marriage can last if one or both of the people in it are being stifled by the other. After a while, you discover that each of you has grown into an even different person than the one you were when you got married, but the person you've grown into is hopelessly tangled up with the person you've married. There's no getting loose! You're totally stuck! ...and you wouldn't have it any other way. A few days ago I noticed my wedding ring. It was on my finger, of course; I never take it off. But these days, I'm not usually conscious that it's there. It just is. It's part of me. It feels wrong if it's not there. That's what marriage is like when it's a good one. And that's why it's good to celebrate when you pass another yearly milestone... something that you weren't born with, something precious and valuable, has become a part of you. And that's something that deserves celebrating!